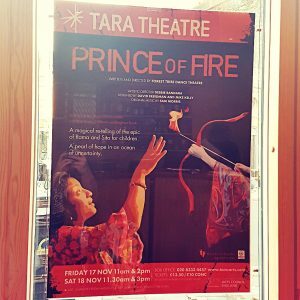 Forest Tribe Dance Theatre‘s Prince Of Fire sounded very interesting, so I ventured out to Tara Theatre to check it out. Aimed at young children over 5 years of age, I was interested in seeing what this dance performance had to offer. 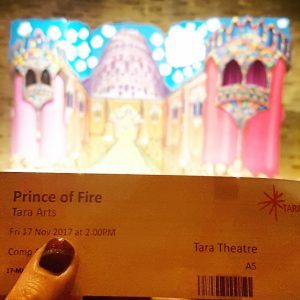 Prince of Fire is based on the story of Diwali, in which Ravana, the ten-headed demon, steals the light and plunges the world into darkness. Prince Rama and Princess Sita’s set out to bring back the light. Bringing folktales to the theatre for children is a wonderful aim and this one hits all the right buttons. The set is a gorgeously painted castle and forest backdrop with lights and hidden screens. All children were given little monkey ear headbands, to participate later on in the play. Opulent music guides the two dancers through the story, with Tom Hardman taking on the roles of Prince Rama as well as Ravana. Very few words are needed as Debbie Bandara makes Princess Sita come to life as a tough and capable fighter with courage, strengt and grace. The children are involved in the show as the army of monkeys, greatly enjoying their chance to jump and dance and monkey around while helping the story along. 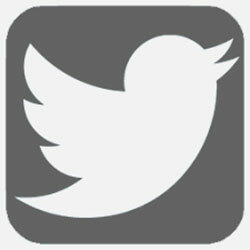 The production is very well geared towards younger children and works really well. 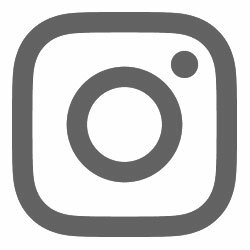 I’m not sure how well the story is understood by the children, as it is more told through movement than through words, but they all seemed quite satisfied and entertained. A cute small production, bringing children closer to dance theatre and a very simplified verion of one of the stories behind Diwali celebrations. I very much enjoyed it and am rating it four and a half out of six rainbow sloths.